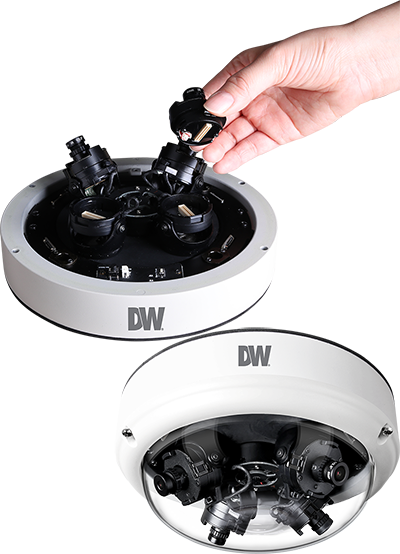 ISC West — Las Vegas, NV (April 11, 2018) – DW®, the industry leader in digital recorders, surveillance cameras and related management software, announces the availability of our new MEGApix® Flex™ 16 megapixel user-configurable multi-sensor vandal dome IP camera. Full-featured MEGApix® Flex™ cameras offer limitless flexibility for a user-friendly and ROI driven solution. Each camera module is easily positioned independently on a magnetic track. MEGApix® Flex™ 16MP multi-sensor configurable view IP cameras lower total system cost by providing four CMOS sensors with complete sensor and field of view customization in one housing and installation. As four independent cameras in one housing, they offer limitless flexibility. The camera reduces installation time and complexity by offering four different lens modules, each individually configurable and independent, easily positioned on a secure magnetic track and each adjustable using a 3-axis gimbal. The Flex™ camera produces four video streams at real-time 30fps. Zoom-in for forensic-quality details with DW Spectrum® IPVMS. Learn more about the new 16MP MEGApix® Flex™ camera and all of DW®’s industry-leading video surveillance products at www.digital-watchdog.com. DW® empowers our customers as the industry-leading single source of value-driven complete solutions for all video surveillance applications (HD over Coax® / hybrid / IP enterprise), focusing on ease of use and ROI. DW® products offer technologically-advanced features including multi-sensor HD cameras at real-time 30fps, Star-Light™ super low light technology, WDR, Smart DNR™ and Smart IR™. Complete IP megapixel surveillance solutions include single- and multi-sensor MEGApix® cameras and edge recording systems, Blackjack® NVRs Blackjack® NAS devices and DW Spectrum® IPVMS for server, mobile and on-camera control. Complete Universal HD over Coax® surveillance solutions include single- and multi-sensor STAR-LIGHT™ Universal HD over Coax® cameras, VMAX® Universal HD over Coax® DVRs and mobile management applications.